Span-America produces a variety of foam mattress overlays, including convoluted and lapidus foam pads and its exclusive Geo-Matt® overlay. The company's mattress overlays disperse body heat, increase air circulation beneath the patient, and reduce moisture build-up in order to prevent the development or promote the healing of pressure ulcers. In addition, the Geo-Matt overlay's geometrically contoured design also significantly reduces shear forces while evenly distributing the patient's body weight, thereby minimizing the pressure that causes ulcers. 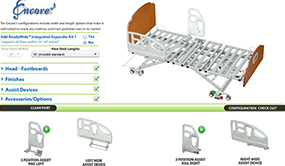 Span-America's non-powered therapeutic replacement mattresses (as distinguished from overlays) are of two types. Geo-Mattress® products are single-density or multi-layered foam mattresses topped with the same exclusive Geo-Matt surface used in the company's overlays. These mattresses are sold as alternatives to standard innerspring and all-foam mattresses found facility-wide in acute and long term care settings. A version is also made specifically for use in home health care. The company's more complex non-powered replacement mattresses consist of products from the PressureGuard® Series. The PressureGuard design was acquired through the acquisition of Healthflex in February 1992. The original design combines a polyurethane foam shell and static air cylinders to form a replacement mattress that incorporates the comfort and pressure relieving features of both mattress overlays and more sophisticated dynamic mattresses. This original design, which the company later used as the basis for powered versions, was further refined through a complete technical upgrade of all PressureGuard components in November 1997. In conjunction with this upgrade, some models were renamed to better reflect their function. In addition to the non-powered, static PressureGuard Renew® (formerly PressureGuard II), the company also offers the PressureGuard CFT®. This model incorporates design principles of constant force technology. First introduced as the CustomCare mattress in June of 1995, the PressureGuard CFT is unique in that it is a dynamic support surface that rivals very expensive powered surfaces, yet requires no power source of any kind. Span-America's powered therapeutic replacement mattresses consist of the remaining models in the PressureGuard Series. In November 1993, the Company received FDA 510K marketing approval for its PressureGuard IV mattress system. Building on the comfort and support of the original PressureGuard design, PressureGuard IV was designed as a sophisticated, powered system for providing pressure reduction and patient comfort, with the added ability to turn the patient. The system was designed to automatically sense the patient's weight and position, and to continually adjust the pressures appropriately while slowly and quietly repositioning the patient at angles up to 30 degrees in cycles of up to two hours. The newly upgraded version, renamed the PressureGuard Turn Select®, incorporates all of these capabilities, as well as several additional features. Of particular note is a pendant-operated, microprocessor-controlled motion system built into the mattress, instead of hanging on the bed frame as a separate unit. Launched in November 1997, the PressureGuard Site Select includes many of the features of the Turn Select, including the built in microprocessor-controlled motion system. However, instead of turning the patient, the Site Select is designed to give the caregiver the ability to selectively adjust the pressure at particular body sites based on patient need. Like the Turn Select, it is completely programmable through a hand-held pendant. All of the powered products in the PressureGuard Series are sold primarily through home health care equipment dealers for daily rental in acute, long term, and home care settings. Another powered system in the PressureGuard line is the PressureGuard APM®, a simpler but very effective alternating pressure mattress. Originally introduced as the DynaGuard®, in November 1994, the APM is targeted primarily at the home care market. A second version called the PressureGuard APM² was introduced in February 2000. It incorporates a second treatment mode - basic lateral rotation - which the user can select at the flip of a switch. Span-America's specialty line of patient positioners is sold primarily under the trademark Span-Aids®. This is the original product line of the Company and consists of more than 300 different foam items that aid in relieving the basic patient positioning problems of elevation, immobilization, muscle contracture, foot drop and foot or leg rotation. Span-Aids patient positioners hold the patient's body in orthopedically correct positions, provide greater patient comfort and tend to promote healing for long-term comatose patients or those with a flaccid or immobilized condition. The positioners also aid in the prevention of pressure ulcers by promoting more effective dispersion of pressure, heat and moisture. Span-Aids are intended for single-patient use throughout the patient's entire treatment program. Among the Span-Aids products presently marketed are abduction pillows, body aligners, head supports, limb elevators and various foot and wrist positioners. Span-America's patient positioners are sold primarily to hospitals and long-term care facilities through several national medical products distributors. Span-Aids are widely recognized as the most effective patient positioning devices available in the health care market, as compared to pillows, rolled towels and other similar materials traditionally used by nursing personnel to position immobilized patients. Span-Aids are constructed of open-cell polyurethane foam which allows air to circulate next to the patient's skin, thereby reducing extensive heat and moisture build-up. Most Span-Aids patient positioners are compression packaged to reduce the amount of storage space required by the hospitals and other facilities that use them. This unique packaging method, which is actually patented by the company, reduces the package size by as much as 75% while protecting the positioners from dust and contamination during transportation and storage. The final category of medical products made by Span-America consists of seating cushions and related products that address the needs of the patient when in the seated position. The company's offerings can be subdivided into three main types. Seating products made specifically as an aid to wound healing include the Isch-Dish® and Sacral Dish® pressure relief cushions. These products become part of the company product line through the acquisition of seating specialty manufacturer Embracing Concepts, Inc. in February 1996. Seating products made for patient positioning and general pressure management include the Isch-Dish Thin and the Geo-Matt Contour cushion. The latter product, introduced in June 1997, combines positioning aid with the Span-America's Geo-Matt anti-shearing surface. Seating products designed to address pressure management without additional positioning benefits include the Gel-T® cushion and the Geo-Matt and Geo-Matt PRT® wheelchair cushions. The Gel-T is a gel/foam combination cushion popular with elderly patients. The Geo-Matt and Geo-Matt PRT cushions incorporate the anti-shearing Geo-Matt surface in a 4" and 3" heights, respectively.